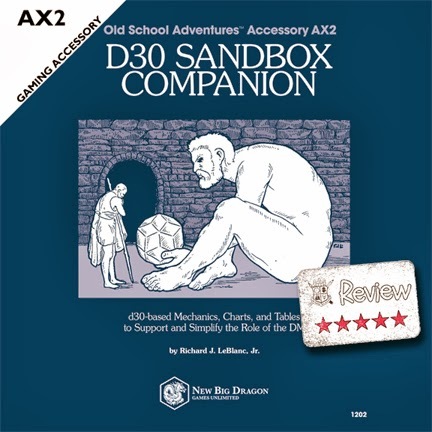 Thanks to a few folks buying up some of my offerings at DriveThruRPG I had enough in my publisher account to pony up the whopping $6 for the D30 Sandbox Companion from New Big Dragon Games Unlimited(affiliate links provided). I've been waiting for a while to get my hands on this title and I'm glad the wait is now over. I'm going to skip ahead to a TLDR overview: Everything good you've heard about this supplement is correct and you should get yourself a copy ASAP. Get yourself a d30 if you don't already have one*. Granted I'm a sucker for tables and this tome of 56 pages is mostly tables, but I'm quite impressed. In general it isn't all that difficult to put down some random tables, but putting together good random tables is an art-form all onto itself. Couple some great, dare I say awesome, GM aides with great tables and you have yourself a winner. I'd love to be able to say, "I can do that", which technically might be correct, but I doubt I'd be able to pull off anything nearly as good. On my initial read-through I noticed that the general layout and even font selection really made it easy to read and follow along. Unfortunately this only went so far because some of the tables are just downright confusing. Silly me, I skipped over the intro pages to get right to the tables and game aides. 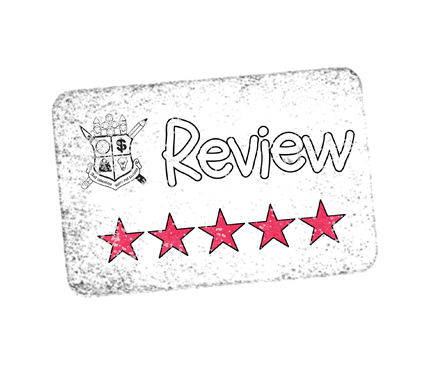 Pages 3 to 5 are solely dedicated to explaining just how to get the most out of this book. There are tables that are essentially two tables in one and a few other aides that really need some introduction. Some tables/aides have additional instructions unique for that item right on the page. While the random tables drew me in, it is the game aids that really sold me on the D30 Sandbox Companion. Some great aides for mapping out an area, town, and making it easy to track/flesh out NPCs. My favorite is the Off Course Determination on page 14. I think it just made me remember something about course deviation regarding mils from my early Air Force land navigation training (don't try to make sense of this). I found it easy to use and just made sense to me. Now with regard to the tables.....awesome tables. What I noticed were tables that really filled in some holes as far as common GM needs and those tables that I might have had different versions of elsewhere.....well I'm going with these d30 tables. To date I've only found one typo....nothing major at that. Even if it was upped to one typo per page I'd be willing to gloss it over for the simple fact that the folks at New Big Dragon Games Unlimited bothered to bookmark this product. THANK YOU!!! One of my biggest pet peeves is when a PDF isn't bookmarked. I'm also glad that NBDGU didn't password-protect the PDF to the point of absurdity. More than once I've come across a PDF that couldn't be used to its fullest effect because it was overly protected. The only "real" issue I have with this PDF is that the majority of the pages are landscape oriented while some are portrait. This made it fun to play with on my tablet, but wouldn't be an issue otherwise. Since I've already given the TLDR overview all I can say is that I thought this was a good purchase and it makes me want to check out the rest of the New Big Dragon Games Unlimited line. I wasn't sure I'd be happy spending $6 on some new (to me) producer's product, but I think I'm going to get more than 6x the usage out of this one item than I'd have gotten out of a smaller $1 table book from someone else (I've seen those $1 tables.....no thanks). *You don't have a d30?! I'm not sure if we can be friends anymore. Just kidding, but seriously though....get a d30 (and this book).